Since her childhood as the daughter of a senior naval officer and diplomat, Diana Thébaud Nicholson has been surrounded by people of diverse cultures and interests. This, combined with her life-long passion for world affairs and conviction that clarity of information and communication is essential to mutual understanding, led her somewhat inevitably to her role with the Jeanne Sauvé Foundation and its Fellows. Educated at the Université de Lausanne in Switzerland and Georgetown University’s School of Foreign Affairs, she worked in Washington D.C. with the French Africa Press service of the U.S. Information Agency (USIA) during the period when the newly independent nations of French West Africa were first establishing their diplomatic ties with the U.S. government. Washington was transforming itself from a sleepy backwater and was suddenly host to people from everywhere including a greatly increased number of international students. Adding to the excitement was the youthful Kennedy administration which urged an increasingly diverse group of young people to join the Public Service. 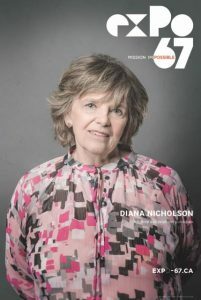 She later worked as one of the first hundred employees of Expo 67, Montreal’s incredibly successful international exhibition. For more than four years, she worked alongside talented Canadians from across the country and professionals from around the world. It was there that she discovered her love of big projects with seemingly impossible deadlines, and that vision, leadership and multidisciplinary teams are essential to meeting those deadlines. It was also there that she learned the value of multi-generational collaboration. Deeply committed to the success of the Program and in particular the success of its Alumni, Diana’s greatest reward is the many enduring friendships formed with Fellows from every cohort and her pride in their personal and professional accomplishments.